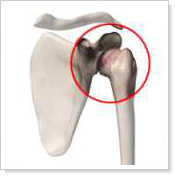 The shoulder is an incredibly mobile joint that undergoes stress to reach, lift or throw. Shoulder movements occur because of the intricate coordination and function of 10 major muscles groups. These muscles play a complex game of tug-o-war to move and rotate the arm. For example, throwing a ball is an incredibly complex function. It requires contracting and relaxing a series of muscles at precise times to bring the ball backwards and then forward to produce the force necessary throwing force. In addition, it has to slow the arm down to complete the motion. However, the shoulder's mobility can lead to a variety of injuries. If any of these muscles are in spasm or injured, it often effects shoulder movement and increases stress on muscles, tendons and joints. This stress overwhelms muscles and tendons producing inflammation and injury. 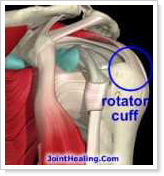 This is very common in throwing injuries or activities that involve repeated shoulder movement. Complimentary Certificate for a Free Evaluation and Examination to determine if your injury or pain can be helped by our treatments. Proper treatment requires addressing the tendon inflammation, relaxing muscle spasms, stretching, and strengthening the shoulder muscles. If the muscles are damage and injuries are not addressed, the problem will likely return. Chronic injuries may have increased amounts of scar tissue or adhesion "old injuries that never healed right." The "old" injuries and scar tissue responds incredibly well to the Graston Technique to restore muscle integrity. Physiotherapy to relax muscle spasm, decrease inflammation, and warm the injured region. Graston technique to break up scar tissue that has developed in muscles, which reduces their range of motion and causes injuries. Stretching assisted by the Doctor. Exercises to specifically retrain weak muscles. Massage therapy on alternate days to relax muscles and address muscle integrity.